The season has been laid to rest. Fans have completed their lamenting of the Anaheim Ducks sweeping the Winnipeg Jets. The healing process has begun. But, before full closure can be completed, an autopsy of the Jets season must be initiated. We turn our evidence-based breakdown of the Jets season with the captain and leader, Andrew Ladd. Numbers include all situations including non 5v5 TOI. Andrew Ladd passed the sixty point mark for the first time in his career. That is some pretty good production for the 29-year-old “overpaid third line player on a good team” (sarcasm meter overload). Ladd’s 62 points came from a season where he actually suffered from a shooting percentage below his career average. His shot production was within similar range of his previous seasons, with the exception of his strong 2011-12 performance. The only number where Ladd struggled this season was in penalty differentials. Ladd led the Jet forwards with the worst penalty differential and it’s not even close. Interestingly, the number of penalties Ladd was called for is only slightly worse than typical. The poor differential extended from a stark lack of penalties drawn, both relative to league average and Ladd’s historical norm. Rankings are out of the Jets 17 forwards with 50+ 5v5 minutes, except special team minutes are each out of 11 Jet forwards. Paul Maurice enjoyed deploying his top line in the offensive zone against the opposition’s top line. Ladd started a very large number of shifts in the offensive zone relative the defensive zone. He faced top quality players often, while predominately playing with top quality players. Ladd played a tonne of minutes too, which is astonishing given the captains sports hernia about midway through the season. Ladd played on the Jets’ top even strength line and on the top power play unit. He also started the season with Little on the top penalty kill unit, although their short handed usage diminished as the season went on (likely due to their injury). typical first line forward and never went under again. Visual courtesy of Micah McCurdy. 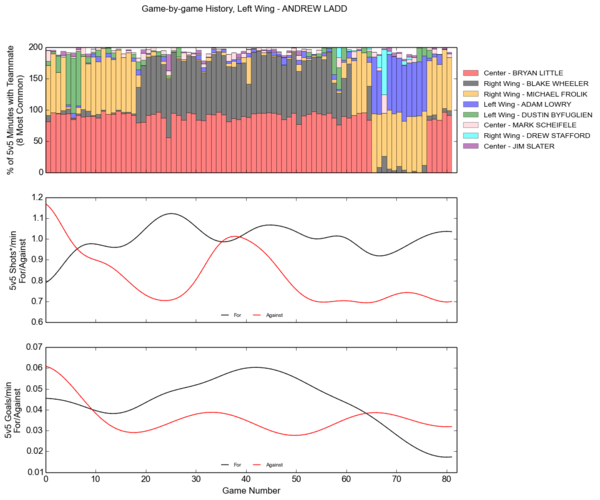 Andrew Ladd spent most of the season with Bryan Little, with the exception of when Little was injured and Ladd played with Adam Lowry. The winger usually rotated between Blake Wheeler and Mciheal Frolik, although Drew Stafford and Dustin Byfuglin also played some minutes with Ladd. While Ladd scored effectively overall, the year was one of Ladd’s lowest in 5v5 points per sixty minutes. This could be a sign of aging curve depreciation although 29 is not that old. RelCorsi tells us that the Jets directed substantially more shot attempts at their opponent’s net with Ladd on the ice versus on the bench. 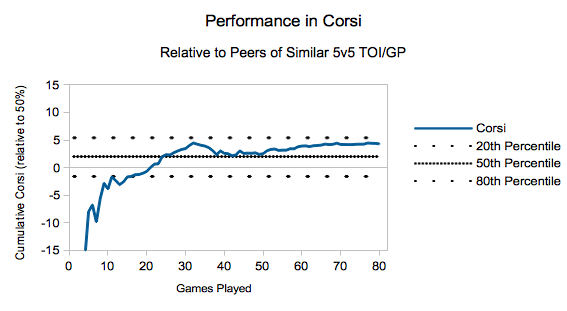 dCorsi suggests that Ladd was just around expectations given the deployment he was given. Adding shot quality into the equation with WAR-on-Ice’s scoring chance metric suggests Corsi may be slightly overvaluing Ladd’s impact, but only by a small amount. Weighting goals more than non-goals in Corsi (wSh Diff) paints Ladd in the best of light. According to Goals Above Replacement, Ladd had the 4th best impact on the Jets goal differential. The numbers suggest that the bulk of Ladd’s impact extends from his ability to improve the Jets shot rates and also his skill as an above average shooter. Andrew Ladd is evidence that hockey intangibles are real, and that they are not intangibles at all but latent variables. An intangible is something the sense cannot perceive, like an idea or copyright. A latent variable is something that you cannot directly measure, but impacts things that can be measured. This is where your hard work, leadership, grit, and other factors fall. Ladd may not be the most “skilled” player in the traditional dangle-on-a-breakaway-sense (although he has an adept eye for tipping point shots into the net). Still, the numbers shine brightly on Ladd. Ladd gets great results due to the “intangibles”. He fights tooth and nail to get the best positioning possible or win the puck battle. He plays as physical as possible. He leads by example by never quitting and nearly always giving 100% effort (injuries happen). I’m pretty sure if Ladd is on your third line you’re playing in the Olympics. On the club level, Ladd would never be a third line player (at this stage of his career). You don’t think a lot of teams would give up a hell of a lot for him? Ask Edmonton what they would give for leadership and the production he offers. People who say that drive me crazy.